Dream Pod 9: Feedback Friday Week 4 (March 2nd, 2018) Previous Weeks Heavy Gear Blitz Feedback and New Polls! For our third weeks Heavy Gear Blitz Feedback Friday polls we had 27 players vote. We'll be leaving the first 3 weeks of polls up for a while to get a larger sampling from players and more feedback on the poll questions asked. Lots of great feedback from players during these first weeks of the Feedback Friday and Heavy Gear Blitz Rules Committee. The results of last weeks polls show us that if we do move some rules like Electronic Warfare and Stealth into an advanced rules section players still want to be able us the miniatures effected by that in the basic game or or be able to use them and have part of their TV cost refunded with 85% voting for those options in the poll. And 70% would like a simplified rule for the basic game of rules that may get moved to an advanced rules section. Our poll for Forward Observing and Target Designator also have similar results with 48% responding they should be advanced rules and 37% going with the option of a simplified rule for them in the basic game. Results for the special weapons effects poll are not clear, and we think more sampling is needed. For the Comms checks 67% selected it should be moved to advanced. Quite a few players left feedback saying we should try and keep all the rules in the basic version, and work on cleaning up the text more complex rules and give better examples so they are easier to understand. We'll be trying this first, and if we can get them easy to understand, then they won't need to get moved to an advanced section. But we are still concerned with overloading new players to the game with to many rules, so an advanced rules section might be the only solution to that. We'll have to work on a better flow to the future rulebook that is easier to read and provides players what they need to know when learning the game, and not have them flipping pages all over the book to find a referenced rule. We got quite a few good comments and ideas on that from players, thank you everyone that left feedback, please keep doing so, we are reading everything. This week we have a few polls on ideas that might speed up the game or make the rule a bit easier. From simplifying movement and sensors in a the future basic game to a possible major change in the formation rules. Click the link below and checkout all the polls, vote, and let us know what you think with your feedback in the comments. No Feedback Friday post for Jovian Wars this week. 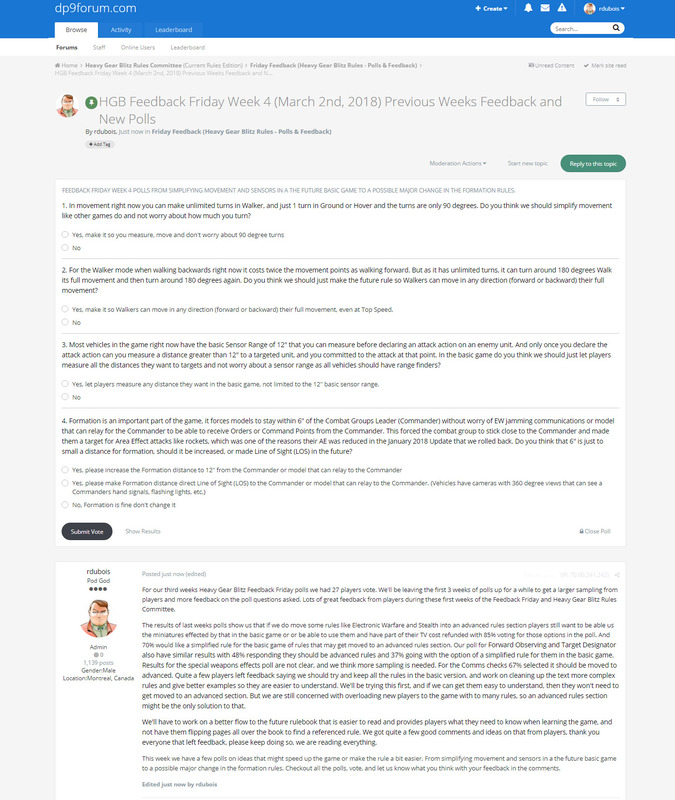 Home › Blogs › Robert Dubois's blog › Feedback Friday Week 4 (March 2nd, 2018) Previous Weeks Heavy Gear Blitz Feedback and New Polls!